The two specks of land known as Big Brother and Little Brother (about 1km apart), lie 70km to the east and on the same latitude as the port of El Quesir. These small islands rise from an abyss 350m deep in the middle of the Red Sea. Exposure to strong currents has left the islands with an abundance of soft corals and giant gorgonians. The Little Brother has a very high concentration of life in a very reduced area. The walls are covered with sponges, anemones and all sorts of soft coral alcyonarian in an astonishing variety of colors and shapes. You will find here plenty of fish. 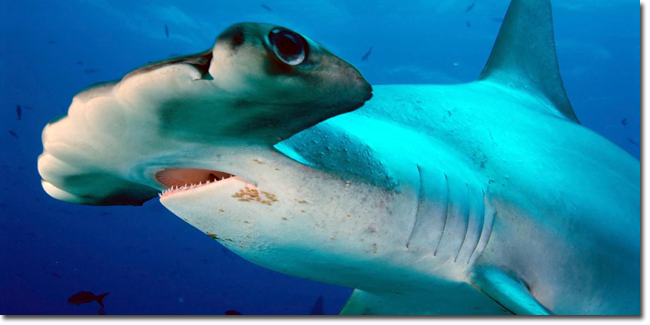 It is not unusual to see sharks: Hammerheads, Thresher Sharks, Grey Sharks, Silvertip and White Tip Reef Sharks. About one km north of the Little Brother lies the Big Brother. Situated, in the middle of the island, is a lighthouse. For the wreck diver, the wrecks of the Aida II, an 82 m long Egyptian supply vessel that sank in 1957, and the Numidia, a cargo ship carrying locomotive spare parts to India, lie at the walls of the Big Brother. Both are covered in a rich growth of soft and hard corals. A great view! Marine life includes a family of Napoleon Wrasse and Grey Reef Sharks. Because of strong current and possibly high waves it is not easy to dive at the Brother’s. This safari is only for experience divers.